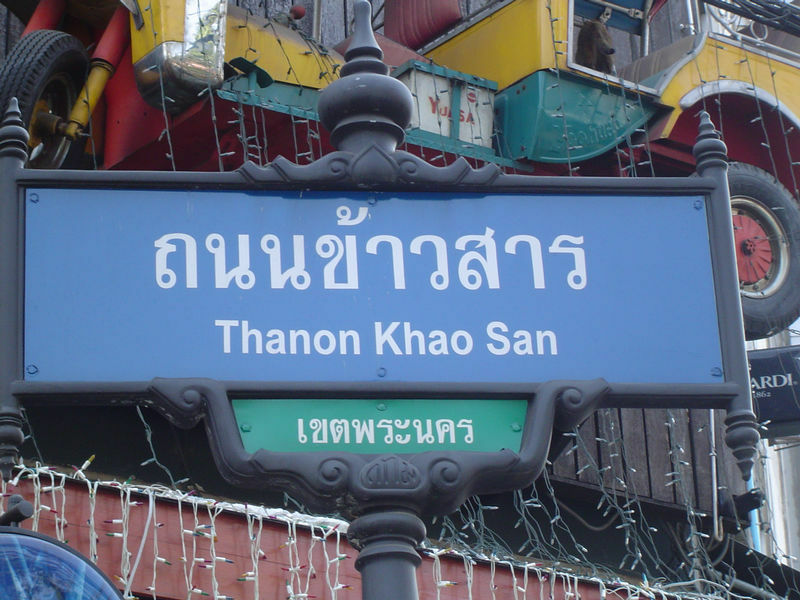 Khao San Road is the backpacker's paradise in Bangkok! 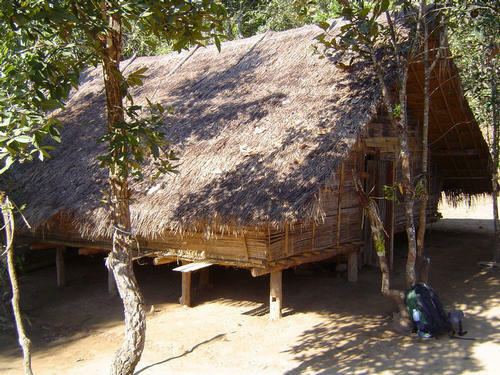 Rooms can be had for as little as five dollars a day, but remember-- you get what you pay for! 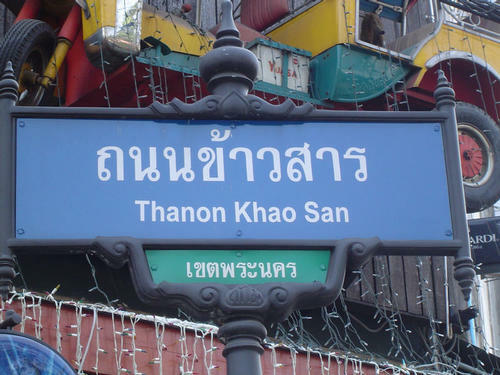 Every night after dark the festivities resume on Khao San Road. Its like one huge block party! 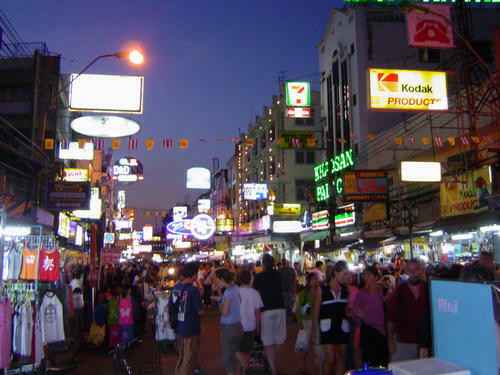 The streets are lined with stalls selling local delicacies. 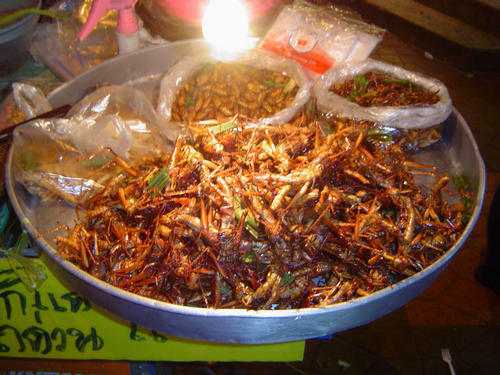 Grasshoppers anyone?? Yum! 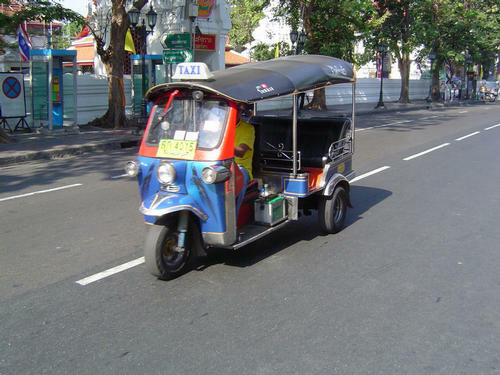 Tuk-tuks are noisy, smelly and ubiquitous. 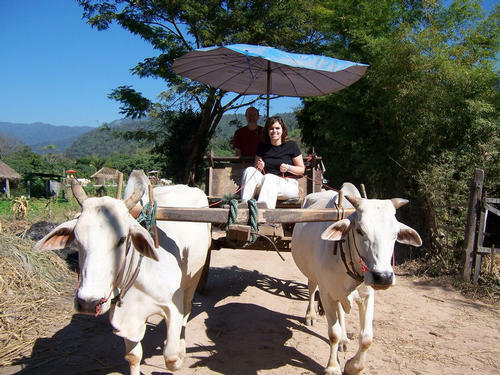 They often overcharge and rarely take you where you want to go! 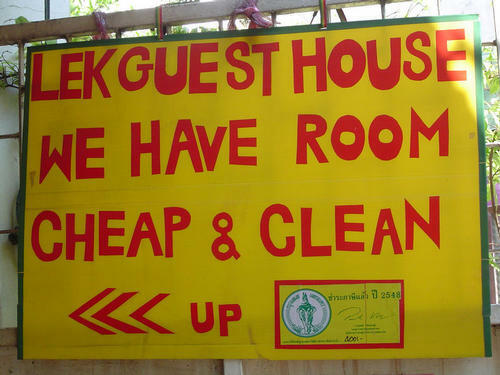 Its best to avoid them. 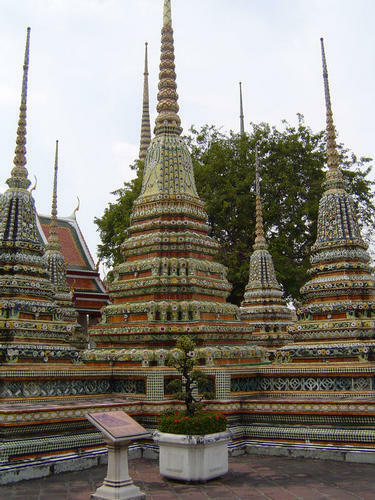 Use the taxis-- they are air-conditioned and metered. 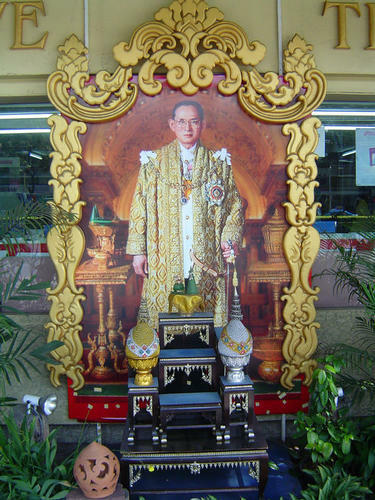 You'll see pictures of King Bhumibol everywhere-- next to Buddha he is the most revered figure in Thailand. 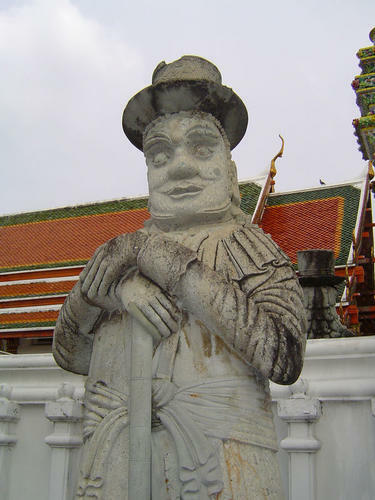 Be sure to follow the house rules even though they may seem a bit odd: when visiting the Royal Palace, shorts and halter tops are forbidden! 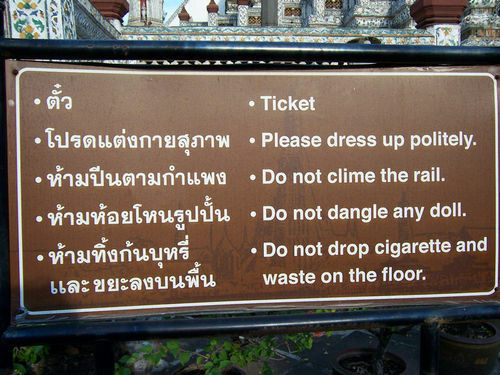 And don't dangle your doll! 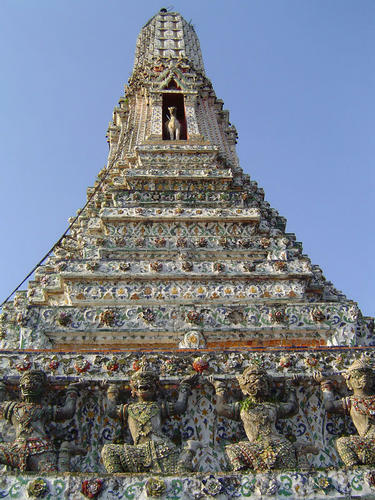 The grounds of the Royal Palace are spectacular--definitely a must-see! 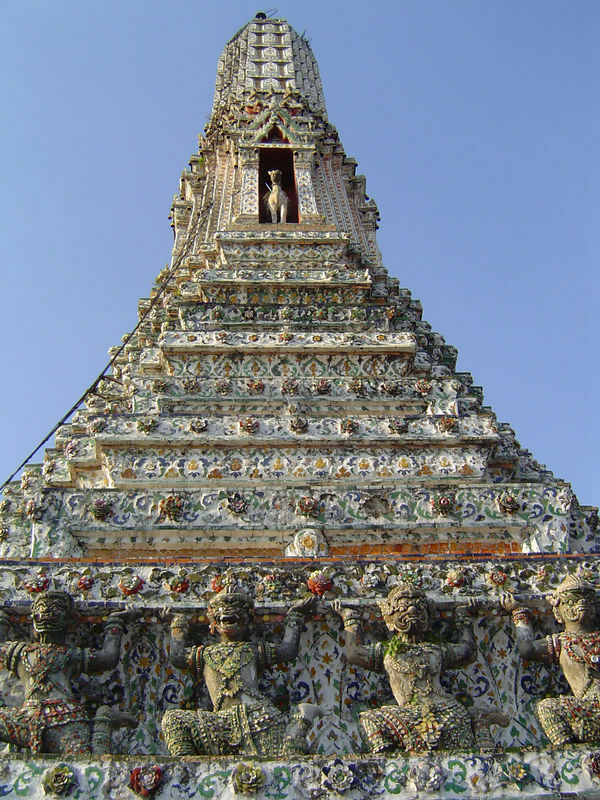 It seems like Bangkok has a monument or temple on every corner. 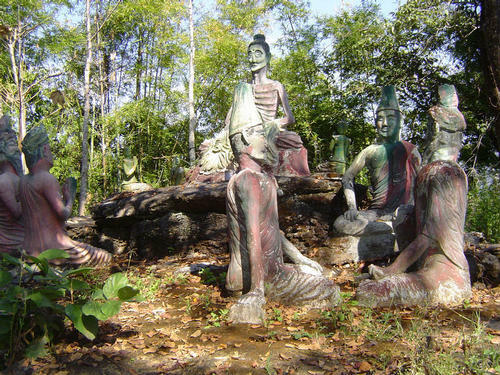 Bizarre sculptures line the hiking trails around Chiang Mai! 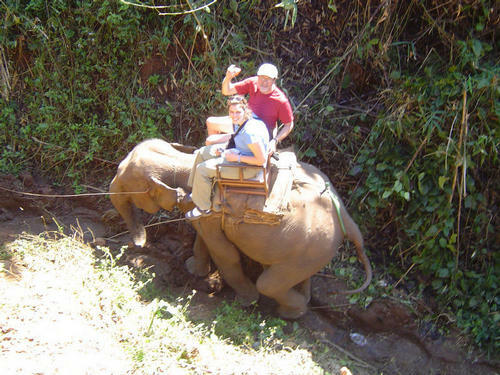 Trekking into the hills surrounding Chiang Mai is an amazing adventure. 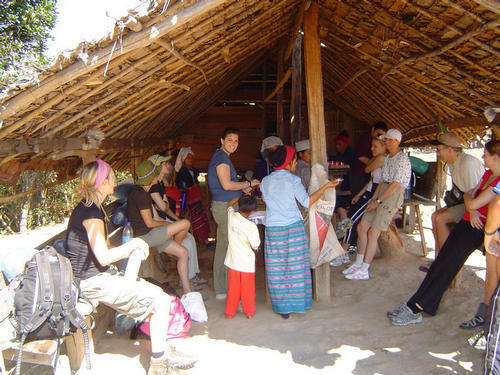 Most treks are three days and two nights and include meals and local accommodations. 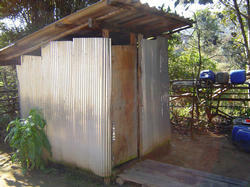 However, as you can see, the facilities are pretty basic! 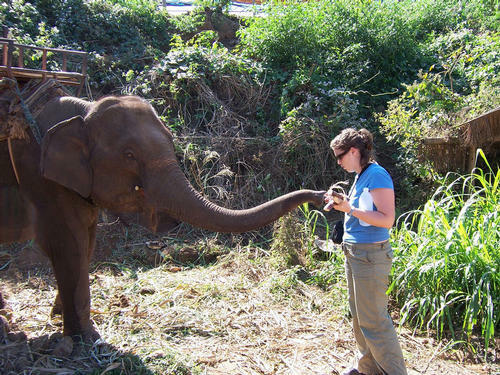 Most treks include an elephant ride-- elephants prefer treats of bananas or sugar cane but will try to eat anything within reach, including cameras! 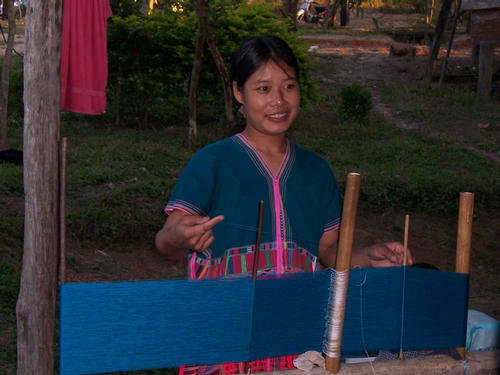 Looms are a common sight-- the locals weave beautiful fabrics to sell to visitors. 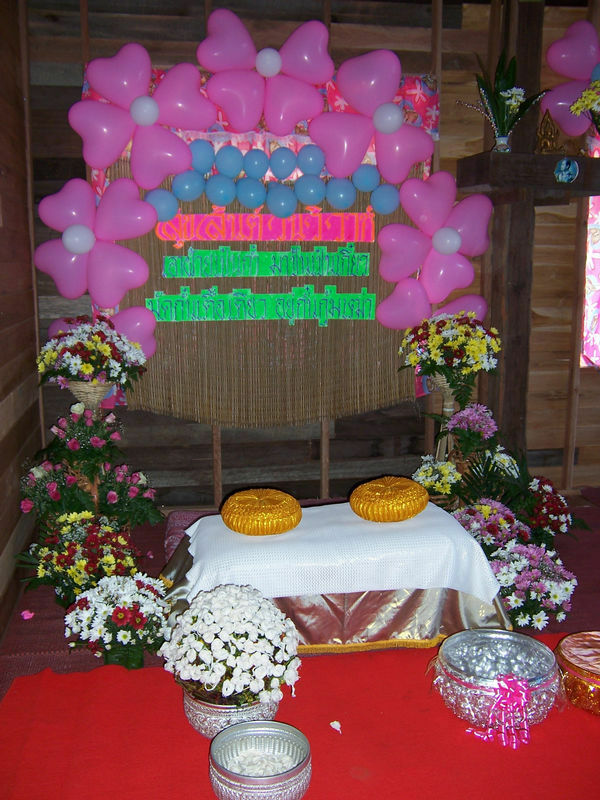 We chanced upon a local wedding celebration and were invited to share a meal with the family! They also allowed our group to view bridal suite. 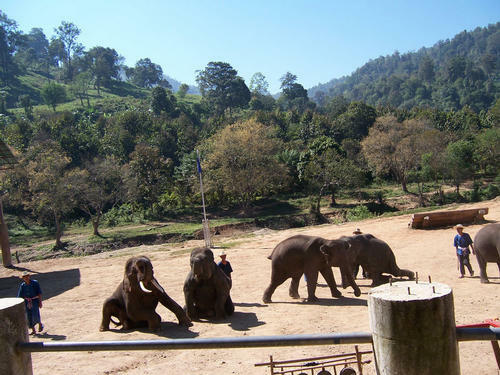 Although elephants are often used to entertain tourists, the government contends that this is for their own protection--we weren't sure whether or not this was a credible claim. 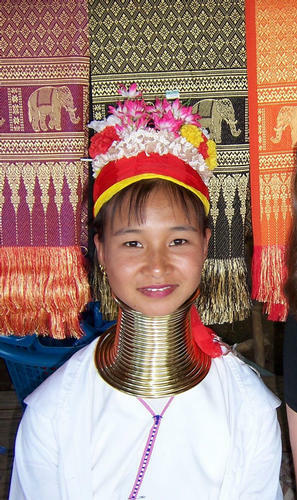 The long-neck tribes place metal rings around the necks of the women when they are young. 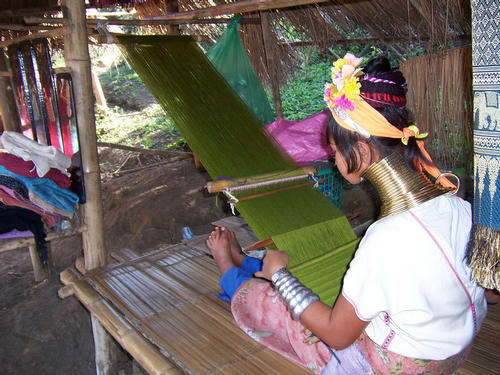 It certainly appears uncomfortable! 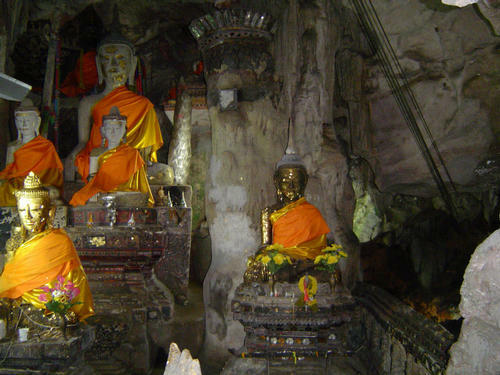 The many caves filled with Buddha figurines are a popular tourist attraction! 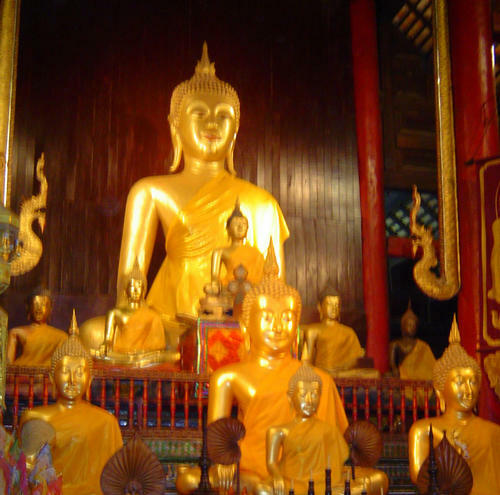 Most temples have one giant Buddha surrounded by many smaller Buddhas!